The Subaru Crosstrek is a good car, but a plug-in hybrid powertrain doesn’t improve it. 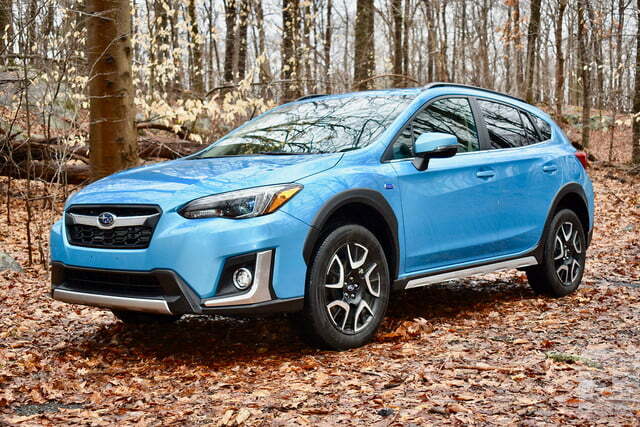 The name may be the same, but there is a very big difference between the 2019 Subaru Crosstrek Hybrid and its predecessor. The 2019 model is a plug-in hybrid, meaning it can recharge its battery pack using either its internal combustion engine or an external electricity source. That means the battery pack can be bigger, allowing the car to rely more on electric power and, in turn, save more fuel. The 2019 Crosstrek Hybrid is Subaru’s first production plug-in hybrid. 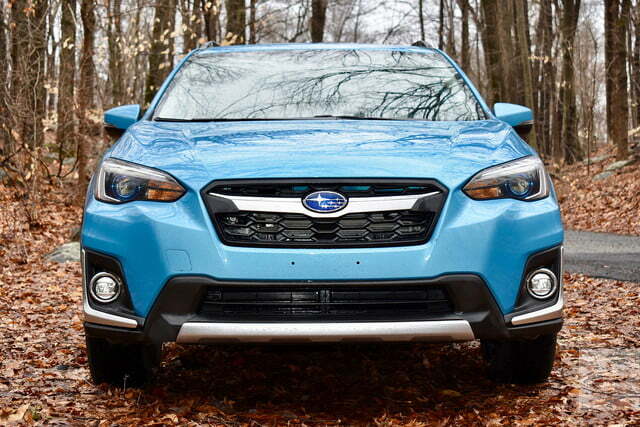 Being in uncharted territory, Subaru leaned on Toyota for the plug-in hybrid technology. The last time these two Japanese automakers teamed up, we got the Subaru BRZ and Toyota 86 sports cars. Can they work the same magic on a green car? 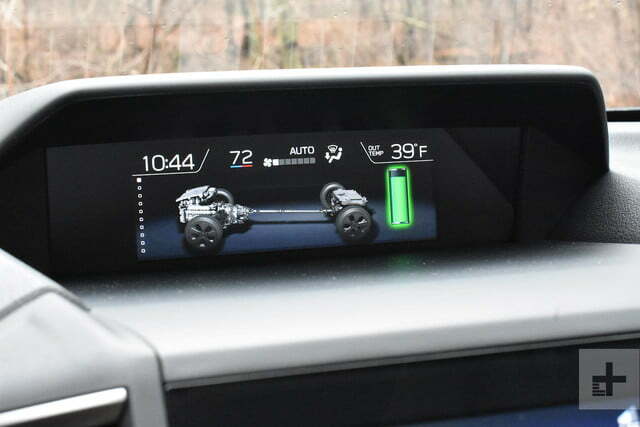 To find out, Digital Trends borrowed a 2019 Crosstrek Hybrid for a week of driving on New York and Connecticut roads. The Crosstrek Hybrid starts at $35,970 (including a mandatory $975 destination charge), which is $7,800 more than the most expensive standard Crosstrek trim level. 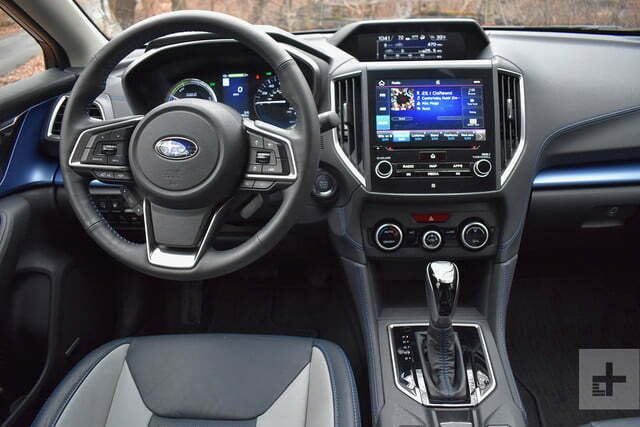 At least Subaru only offers the plug-in hybrid model in one trim level, although our test car also had a $2,500 option package that adds a moonroof, a heated steering wheel, navigation, and an eight-speaker Harman Kardon audio system. Subaru markets the Crosstrek Hybrid as a crossover, but it’s really just an Impreza hatchback playing dress-up. 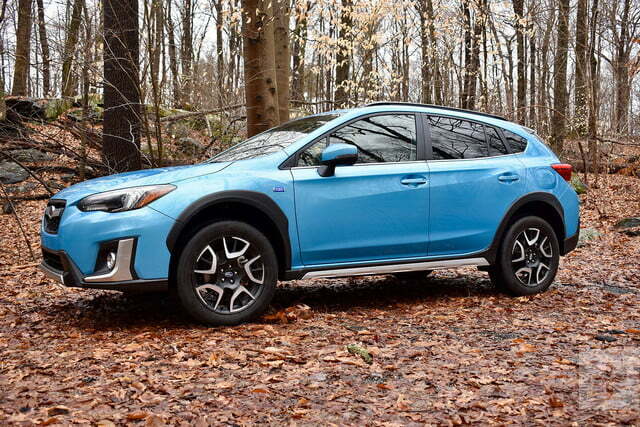 Like other Crosstrek models, the Crosstrek Hybrid has a slightly higher ride height than an Impreza, affording a respectable 8.7 inches of ground clearance (which is important for off-roading), as well as gray body cladding. A crossover is much more attractive to car buyers than a regular hatchback, but the Crosstrek shows how thin that distinction can be. 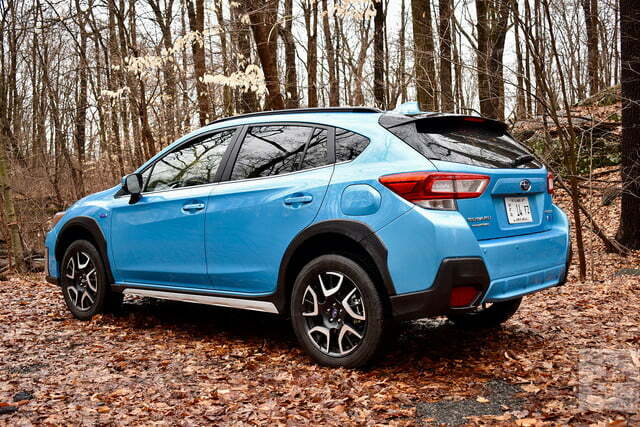 The Crosstrek Hybrid looks almost identical to a standard Crosstrek. The only giveaways are exterior “plug-in hybrid” badges (which begs the question of why Subaru omitted “plug-in” from the car’s official name), a charge port located on the opposite side of the car from the fuel door, some silver trim, and model-specific 18-inch wheels. 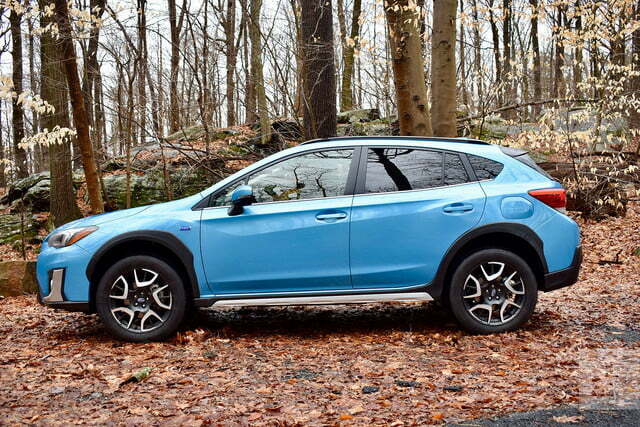 If you really want your Crosstrek Hybrid to stand out, get our test car’s Lagoon Blue Pearl paint. The color is exclusive to the plug-in hybrid model. 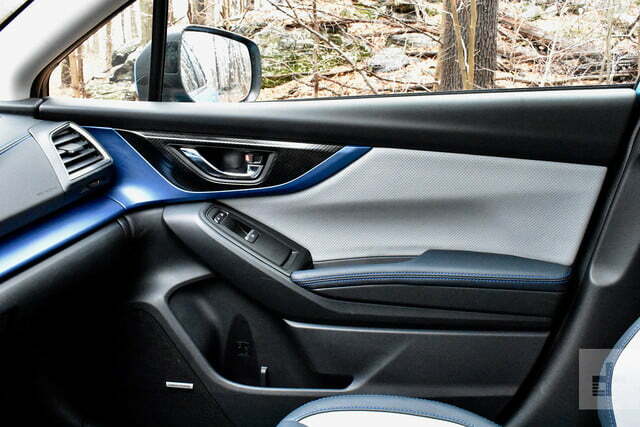 The interior is mostly standard Crosstrek as well, but with an added splash of color. Blue trim panels and gray/navy blue two-tone leather seats with contrast stitching really liven things up, although the fake carbon fiber trim pieces looked a bit cheesy on a car not designed to go racing. We found the Crosstrek Hybrid’s Starlink infotainment system to be very intuitive and refreshingly simple. Our test car’s optional moonroof ate into headroom slightly, putting the Crosstrek Hybrid slightly below the Toyota Prius Prime and Kia Niro PHEV. 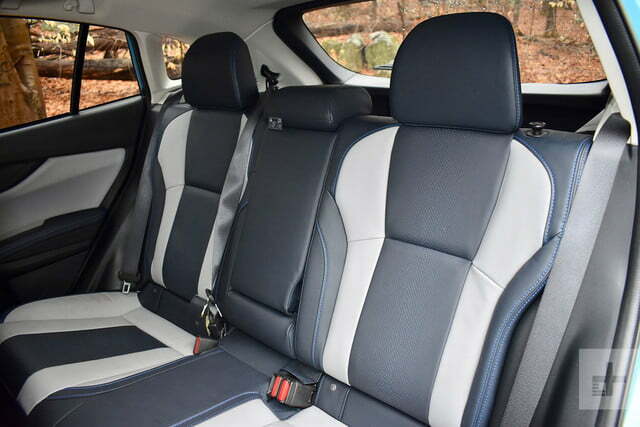 The Kia offers more rear legroom as well, although rear-seat passengers still have plenty of room to stretch out in the Subaru. The Mitsubishi Outlander PHEV is a real crossover, offering greater interior space than the other vehicles. 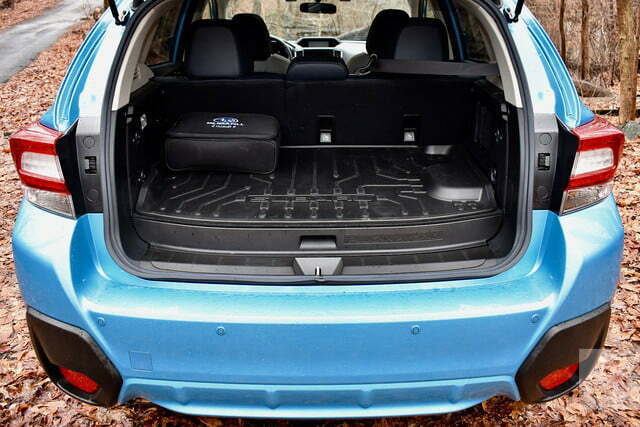 The Crosstrek Hybrid falls short in cargo space. Because the battery pack is housed under the trunk floor, space for stuff is reduced. Cargo capacity is 15.9 cubic feet with rear seats up, and 43.1 cubic feet with the rear seats folded, down from 20.8 cubic feet and 55.3 cubic feet with the rear seats up and down, respectively, for the standard Crosstrek. The Prius Prime doesn’t have folding rear seats, but does have 19.8 cubic feet of cargo space. Both the Kia Niro PHEV and Mitsubishi Outlander PHEV offer more cargo space with the rear seats up or down. Like other recent Subaru models, the Crosstrek Hybrid gets the automaker’s Starlink infotainment system with standard Apple CarPlay and Android Auto compatibility. The standard 8.0-inch touchscreen features easy-to-read graphics and is backed up by analog shortcut buttons and a volume knob. 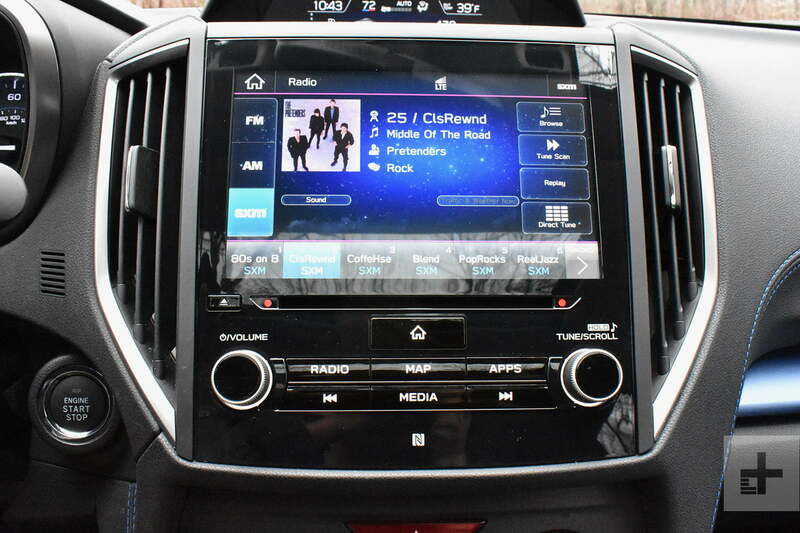 A second, smaller screen sits in a hood at the top of the dashboard, and can display everything from the current radio station to the status of the plug-in hybrid powertrain. It’s positioned close enough to the driver’s line of sight to make quick glances minimally distracting. A 4.2-inch display in the gauge cluster shows much of the same information, and both displays can be manipulated using buttons on the steering wheel. 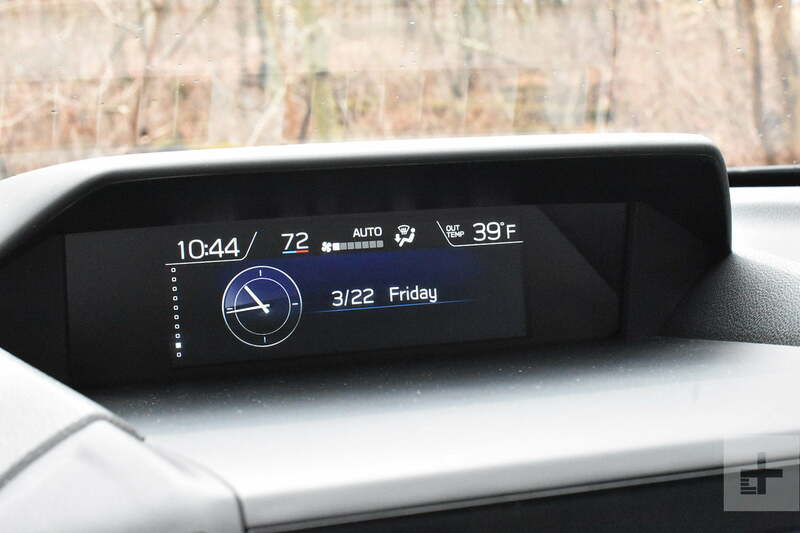 Overall, we found the Crosstrek Hybrid’s Starlink infotainment system to be very intuitive and refreshingly simple, just like in most other Subaru vehicles we’ve experienced it in. However, the eight-speaker Harman Kardon audio system was not as impressive, delivering tinny sound quality. The Crosstrek Hybrid comes standard with Subaru’s EyeSight driver-assist system, which uses cameras mounted by the rearview mirror to enable features like adaptive cruise control, lane-keeping assist, and autonomous emergency braking. 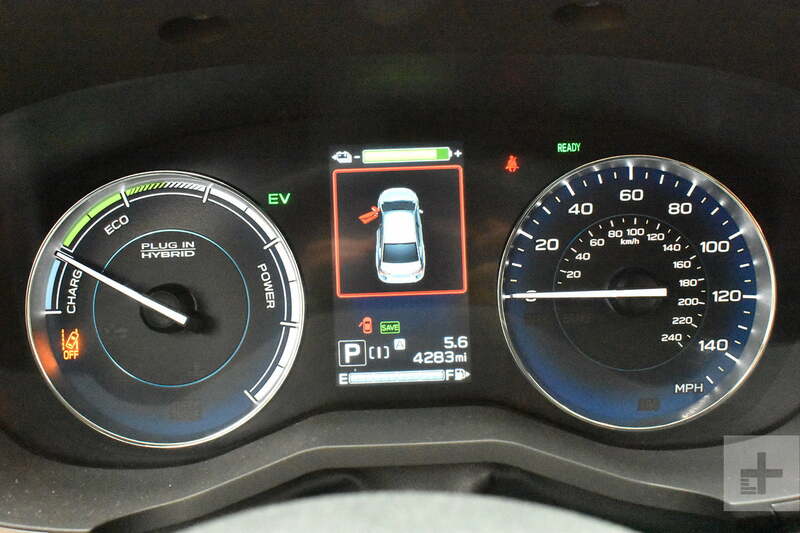 We didn’t have to test that last feature, thankfully, but the adaptive cruise control worked well. We felt the lane-keep assist took too long to intervene, however. The Crosstrek Hybrid also sports a noisemaker to alert pedestrians when the car is traveling below 20 mph in electric mode, to compensate for the lack of engine noise. The Crosstrek Hybrid feels exactly like what it is: a marriage of Subaru and Toyota components. Subaru’s 2.0-liter, flat-four engine and its time-tested all-wheel drive system work with a Toyota-sourced plug-in hybrid system to produce a peculiar driving experience. The Crosstrek Hybrid felt quick off the line, a benefit of the instant torque delivery of an electric motor. The engine note says Subaru Crosstrek, but the powertrain’s responses say Toyota Prius Prime. The car constantly switched between gasoline and electric propulsion to achieve the right combination of power and efficiency. But you don’t need to worry about that. You just need to put your foot down and go. 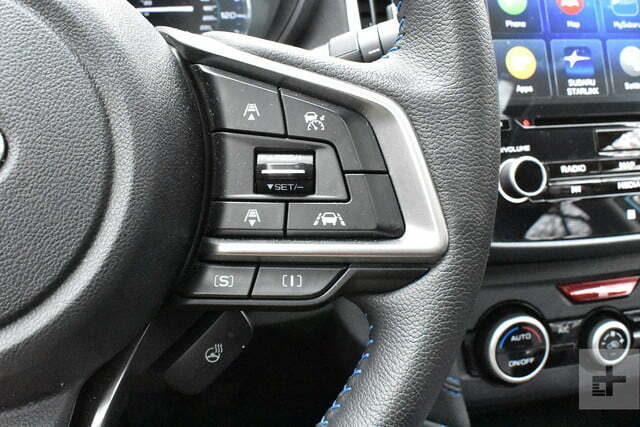 However, we wished for paddle shifters to control regenerative braking – like you get on a Mitsubishi Outlander PHEV – to take full advantage of the plug-in hybrid powertrain. Despite having two forms of propulsion, the Crosstrek Hybrid actually produces less overall power than its gasoline-only counterpart. 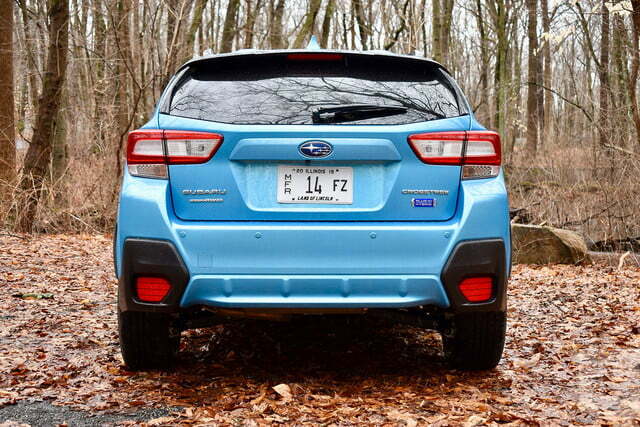 Subaru quoted the system’s total output at 148 horsepower, compared to 152 hp for the standard Crosstrek. Yet Subaru said the plug-in hybrid version will do zero to 60 mph a full second quicker than the standard Crosstrek. The plug-in hybrid did feel quick off the line, a benefit of the instant torque delivery of an electric motor. However, electric assist only works at speeds up to 65 mph. A plug-in hybrid needs to excel in efficiency as well as zero-to-60 mph sprints. The Crosstrek Hybrid’s 8.8-kilowatt-hour, lithium-ion battery pack allows for an EPA-rated electric range of 17 miles with an efficiency rating of 90 MPGe combined. 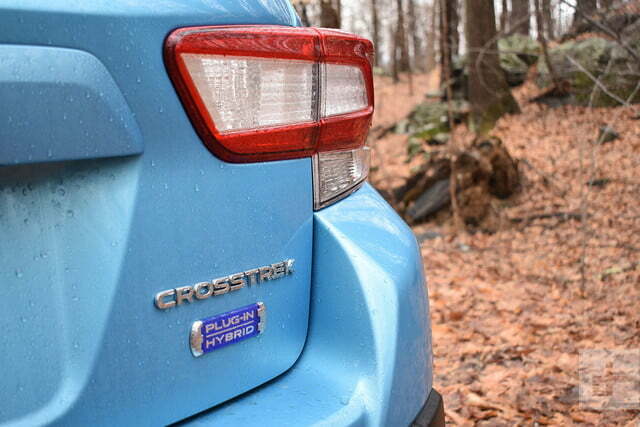 On gasoline, the EPA rates the Crosstrek Hybrid at 35 mpg combined. We averaged 32.3 mpg, according to the car’s trip computer. The Kia Niro PHEV and Toyota Prius Prime offer more electric range and greater efficiency than the Subaru. The Kia is rated at 26 miles of electric range, 105 MPGe combined on electricity, and 46 mpg combined on gasoline. The Toyota is rated at 25 miles of electric range and 133 MPGe and 54 mpg combined on electricity and gasoline, respectively. Neither vehicle is available with all-wheel drive, however. The Mitsubishi Outlander PHEV does have all-wheel drive, as well as more electric-only range than the Subaru (22 miles), but with lower efficiency (74 MPGe on electricity, 25 mpg on gasoline). The Crosstrek Hybrid doesn’t really perform the crossover or plug-in hybrid roles very well. Subaru expects a full recharge to take two hours using a 240-volt, level two AC source – the fastest charging option available. Mitsubishi offers a CHAdeMO DC fast-charging system on the Outlander PHEV that can recharge the battery pack to 80-percent capacity in 25 minutes. Helping the Crosstrek Hybrid in its mission as a crossover competitor is a claimed towing capacity of 1,000 pounds, when properly equipped. That’s pretty good considering that towing typically isn’t a priority for plug-in hybrids in this price range. However, the Mitsubishi Outlander tops the Subaru with a 1,500-pound tow rating. The plug-in hybrid field is eclectic, with the Crosstrek Hybrid’s main rivals each taking a different approach to the concept. Despite its EPA-rated 53 miles of electric range, we’re leaving out the Chevrolet Volt because it recently went out of production, as well as the Hyundai Ioniq, because of its limited availability. The Ford Fusion Energi and Hyundai Sonata/Kia Optima plug-in hybrids are also out, as they’re too dissimilar even for this varied group. Kia Niro PHEV (base price: $29,495): Like the Crosstrek Hybrid, the Kia Niro is a hatchback masquerading as a crossover. The Kia beats the Subaru on electric range and efficiency, as well as on cargo space. It’s also a bit nicer to drive (it feels more like a normal car), but it lacks all-wheel drive. Mitsubishi Outlander PHEV (base price: $36,890): The only true crossover in this price range, the Mitsubishi offers vastly more passenger and cargo space, as well as more electric range than the Subaru. 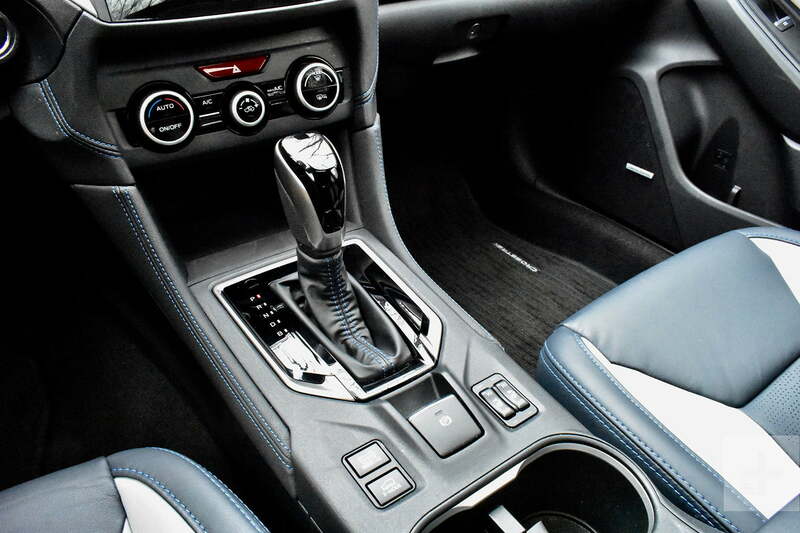 It also includes driver-adjustable regenerative braking and DC fast charging – two features the Subaru lacks. But the Outlander is also a bigger vehicle that isn’t as much fun to drive as the nippy little Crosstrek, and Mitsubishi is a step behind in interior materials. Toyota Prius Prime (base price: $28,280): The Crosstrek Hybrid’s cousin is the most efficient car here, and isn’t that the point of a plug-in hybrid? Granted, the Prius Prime lacks fold-down rear seats, Apple CarPlay/Android Auto, and all-wheel drive. Its styling is an acquired taste, but it’s the best choice for buyers who are serious about saving fuel. Subaru offers a three-year, 36,000-mile, basic warranty and a five-year, 60,000-mile, powertrain warranty. While the plug-in hybrid powertrain adds a new variable, the standard Crosstrek received a high reliability rating from Consumer Reports. As a brand, Subaru has a good overall reputation for reliability. Crash-testing ratings are only available for the standard Crosstrek. It received a Top Safety Pick+ rating from the Insurance Institute for Highway Safety (IIHS), and a five-star overall rating from the National Highway Traffic Safety Administration (NHTSA). Subaru made this one easy for us. 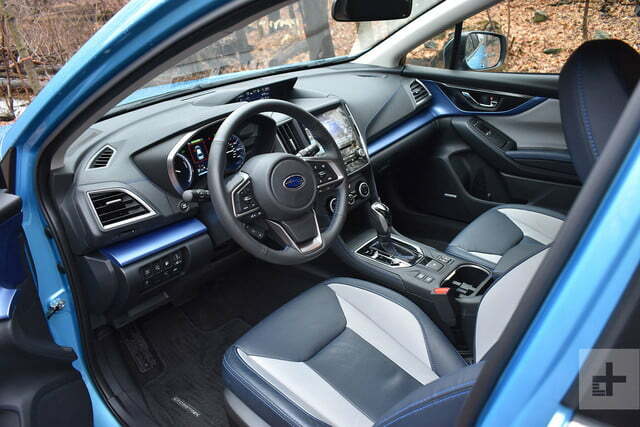 The Crosstrek Hybrid is only available in one trim level, with one $2,500 option package that adds a moonroof, a heated steering wheel, navigation, and an eight-speaker Harman Kardon audio system. That’s a box we would check. Those features seem worth the price, even if we were underwhelmed by the audio system’s sound quality. 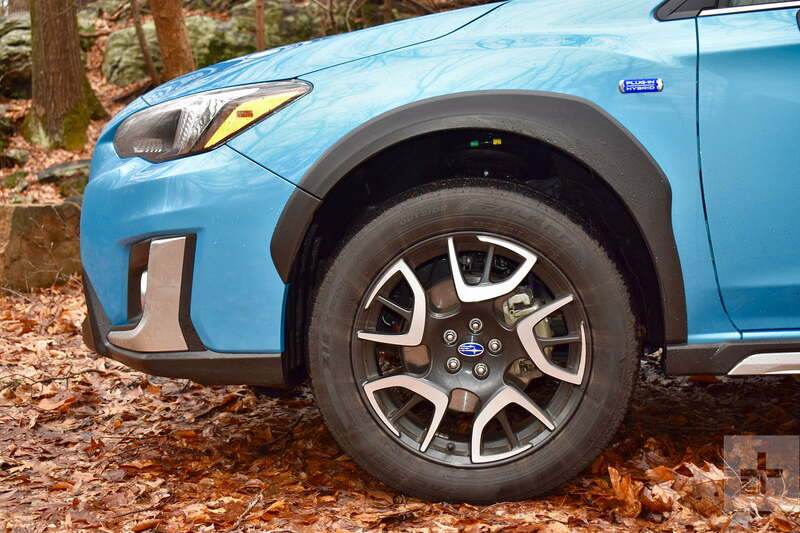 The 2019 Subaru Crosstrek Hybrid is less than the sum of its parts. The standard Crosstrek is a great car, and Toyota is the best in the business at developing hybrid powertrains. But Toyota’s own Prius Prime, as well as the Kia Niro PHEV, offer greater efficiency, while the Mitsubishi Outlander PHEV is a true crossover. The Crosstrek Hybrid doesn’t really perform the crossover or plug-in hybrid roles very well, and it’s much more expensive than a standard Crosstrek, to boot. No. The Crosstrek Hybrid’s greater fuel efficiency and quicker acceleration don’t justify the significant price premium over a standard Crosstrek, and other automakers offer better plug-in hybrids. If you want a practical small car, get a Crosstrek without the plug-in hybrid system. If you want a plug-in hybrid, get a Toyota Prius Prime or, if you can find one, a leftover Chevrolet Volt.